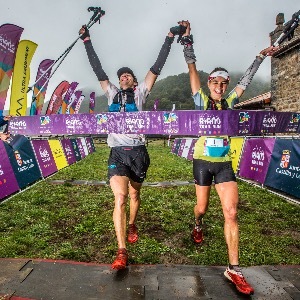 Landie & Christiaan Greyling has been on the trail running scene since 2008. They were in love with the sport from the very start. The couple met on a trail, got engaged on trail and even married on a trail in 2012. Trails are where they spent most of their time together and the results are paying off! Landie Greyling has achieved top positions on the international racing scene with wins in the Buffalo Stampede (Australia), Dodo Trail (Mauritius) & Azores Trail amongst others. She recently placed 4th in both the Mont Blanc Marathon, Mont Blanc 85km and Les Templiers 76km & top 10 in the World Ultra Trail Champs. Locally she has won all the major SA trail races, including Otter, Skyrun 100km, Ultra Trail Cape Town 100km, Table Mountain Challenge, African X and winning all trail races in SA in her career. Christiaan initially suffered from all running injuries possible, but learned how to overcome them by applying the correct training. After 5 years of perseverance Christiaan holds the titles for the Ultra Trail Cape Town 100km & Skyrun 100km and placed 13th in the Mont Blanc 85km, 2016 and improved to a 6th position in Mont Blanc 2017's 85km race. He won the Azores 42km trail in May 2017. Together the Greylings make a formidable team and finished second in the 8-day Trans-Alpine run in Europe in 2015. We are ready to share our knowledge and experience through our online coaching platform with trail enthusiasts who want to reach their goals and be the best that they can be!! I like to work with athletes who have clear goals. People who run with heart, and enjoy the outdoors. I work with any athlete you wants to improve or race a specific race. Success. Coach Landie Greyling has been notified of your message.